Picasso Sculpture, the new HUGE exhibit at the Museum of Modern Art, opened to the public yesterday. I went to a member preview on Friday and was amazed at the crowds at 9:30 in the morning. 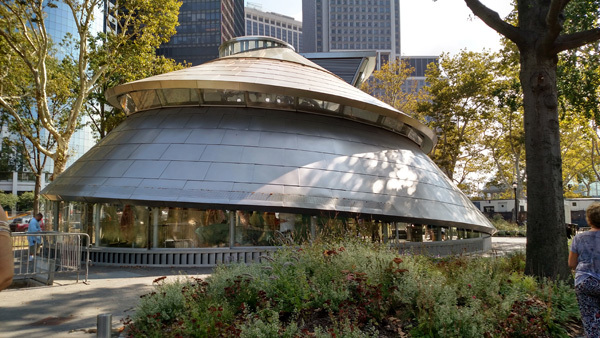 I hadn't read anything about the exhibit, and was totally surprised that the entire 4th Floor Permanent Exhibit space was cleared and then 11 galleries - 140-150 sculptures by Picasso - were installed. We learn that Picasso was never trained in sculpture, but he tried every form, and the galleries are individually devoted to one form or another. I almost couldn't leave the opening gallery in which he worked in sheet metal. 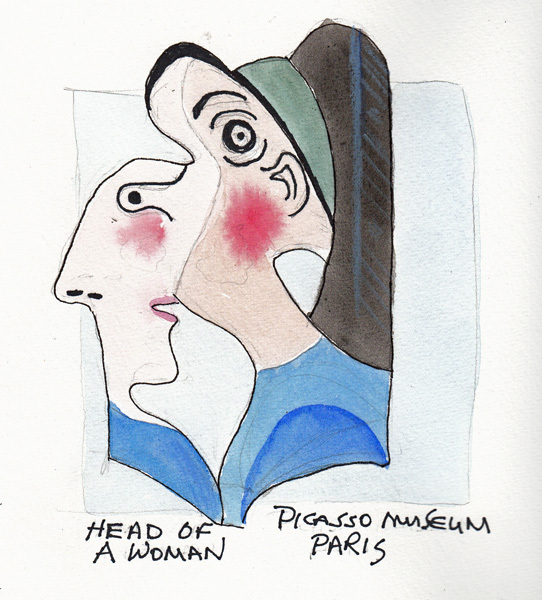 By the end of the exhibit I knew I had to go back there for one drawing - Head of a Woman. 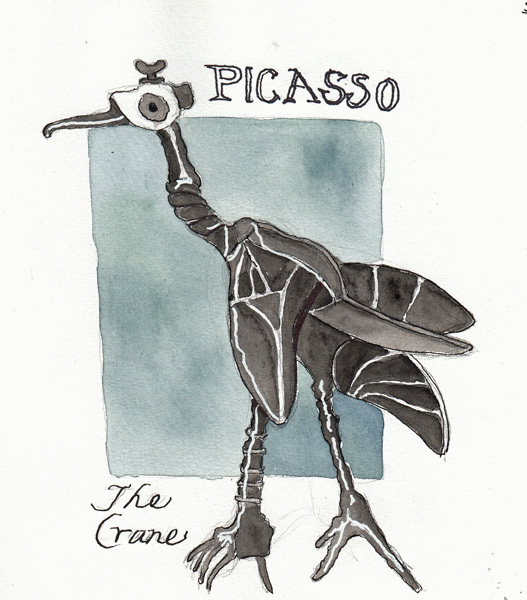 This is the first sculpture I just had to draw - The Crane. The head is a spigot, the neck and tail appear to be a shovel - and all of it is painted black with white accents. When I draw a piece of art, I feel it seeping into my brain and body - and never forget the joy I experienced when I first saw it. 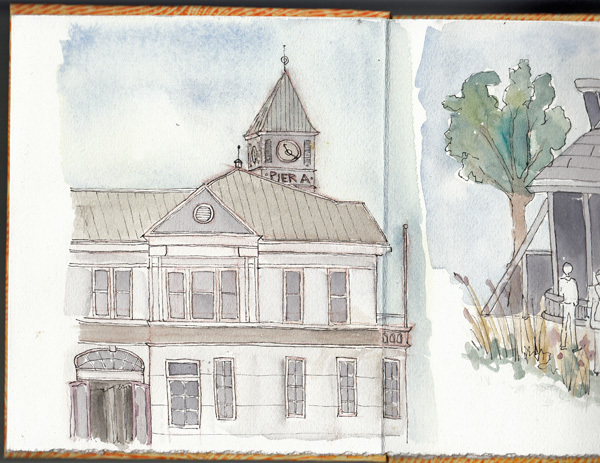 Both drawings were done in front of the sculpture, then painted at home from my photos. After drawing the Crane, I had to return to Gallery 1 to draw the sheet metal sculpture of a Woman - that I loved from minute one of my visit. This is a single piece of metal that is cut, bent back on itself, and then painted. This is an exhibit that I will return to again, maybe many times before it closes in February. There were pieces in each gallery that I wanted to draw, and probably will. If you are in New York City this Fall, it is a once in a lifetime collection of work by Picasso. 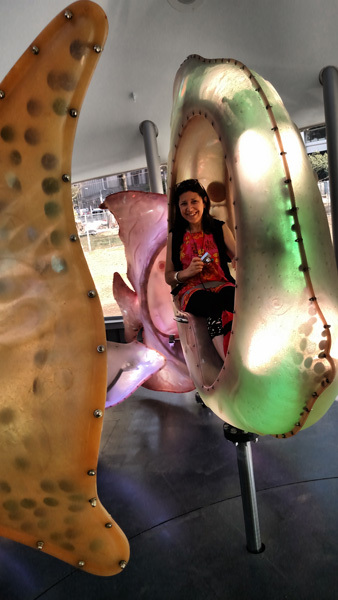 Wednesday Art Day began at the Seaglass Carousel - our first ride on this beautiful piece of art. 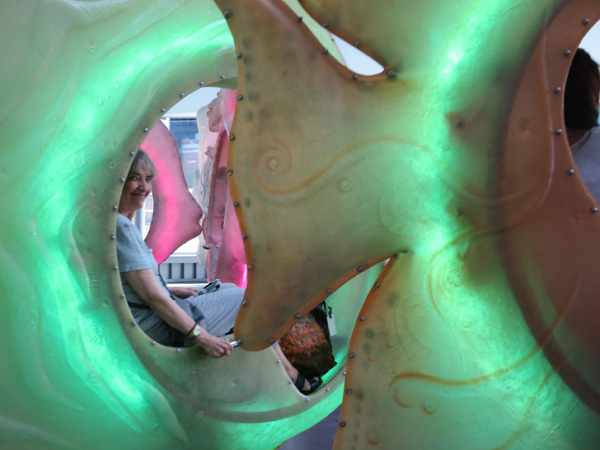 The exterior was designed to look like a nautilus and this is a photo from a different angle than I posted before, followed by pictures of Benedicte and I enjoying the ride. We loved every minute of it - seeing each other only intermittently as our fish rotated. 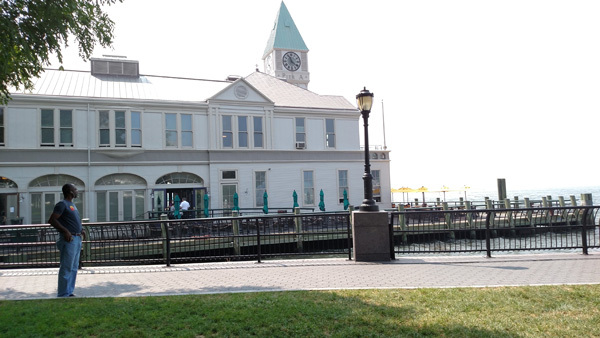 We walked down through Battery Park to Wagner Park with huge smiles. I just started drawing when I started to receive emails from friends asking if my email was hacked. So my drawing time was unfocused at best. 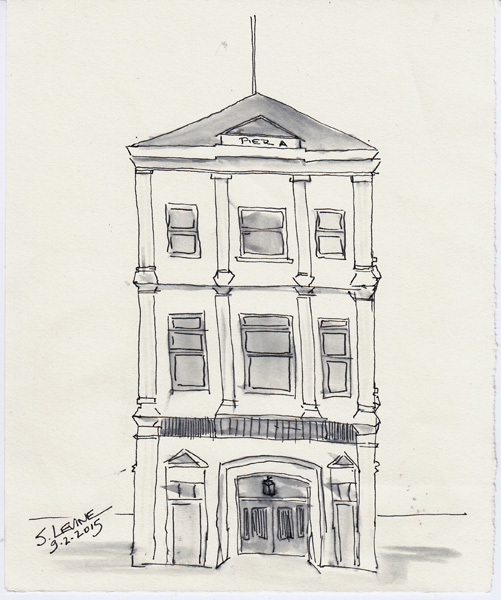 I did one drawing of the building in which Gigino's Restaurant is located, then another very simplified drawing using some of Marc Taro Holmes techniques from Lesson 2. After lunch we went to Figure Al Fresco and Steve was our model for the afternoon. He is the weight lifter/runner and each time he models he gets better. He thoroughly enjoys it, and I wanted to just post a few of his very unusual poses. The amazing thing is that he can hold them for the specified time. One of 4 five minute poses - his position was so unexpected he made all of us laugh. 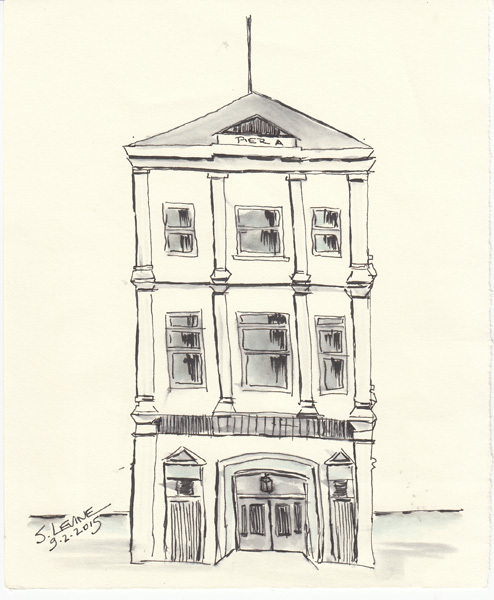 My first 10 minute sketch was rained on, ending the afternoon prematurely as the soluble graphite started to run! We ran to a coffee shop to sit out the rainstorm and then walked to the subway in the sunshine. I am still doing homework and practicing skills from Marc Taro Holmes' Craftsy class (Lessons 1 and 2). 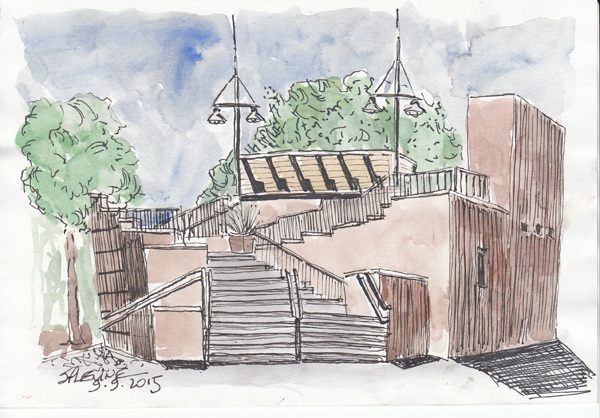 My two drawings of Pier A, in Battery Park City were drawn with a Pilot Metropolitan fountain pen, then darkened with a Pentel Pocket Brush Pen, and then touched with a waterbrush to pull out some more color. The Nakima black ink pulls out as blue. 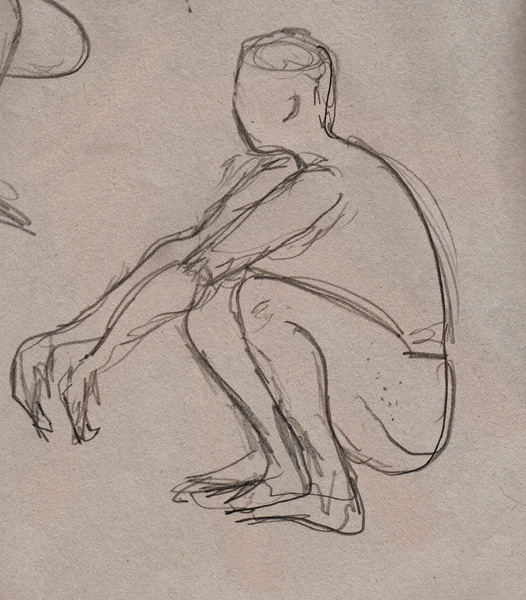 I've watched Lesson 2 twice, because I am incapable of seeing how to draw an image just by drawing the shadows. 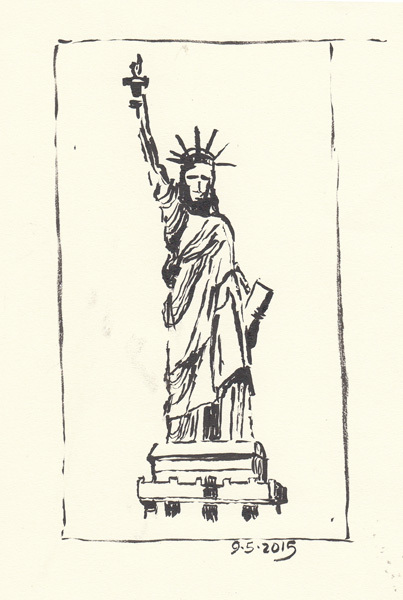 This is from a photo of the Statue of Liberty, and she was created completely with a Pentel Pocket Brush Pen. And this is my second attempt at drawing just the shadows and then using a fountain pen to add some marks and some tones. 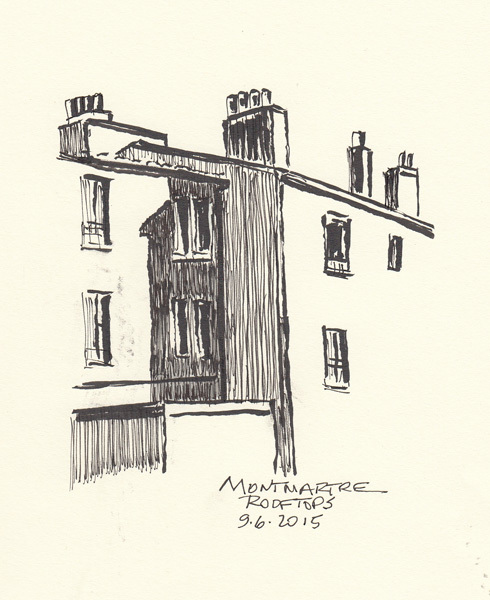 I took this photo of rooftops from an apartment window in Montmartre, Paris. Practice of these techniques are to be continued, and hopefully used on our Fall trip to Spain. 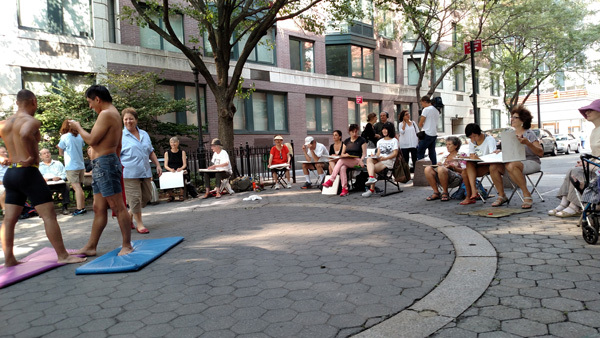 I am taking Marc Taro Holmes' Craftsy Class on Travel Sketching and was anxious to do more homework before arriving at Battery Park City on Wednesday. 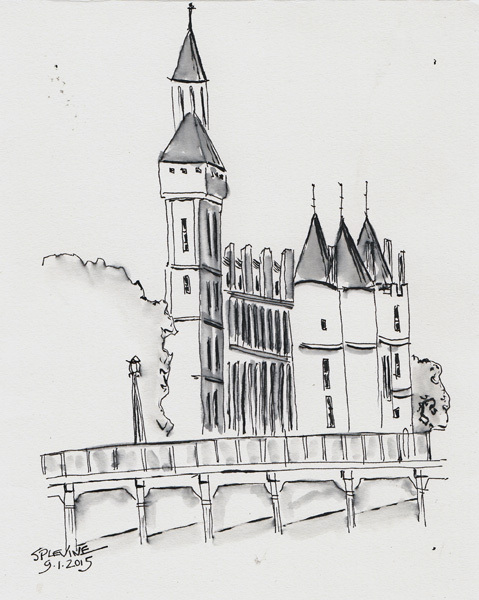 I draw fast and more accurately when I don't use continuous lines, so the evening before I gave up the continuous line and quickly sketched the Conciergerie in Paris in pen, from one of my photos, and then "added the darks." After just one video I know I will love his lessons. 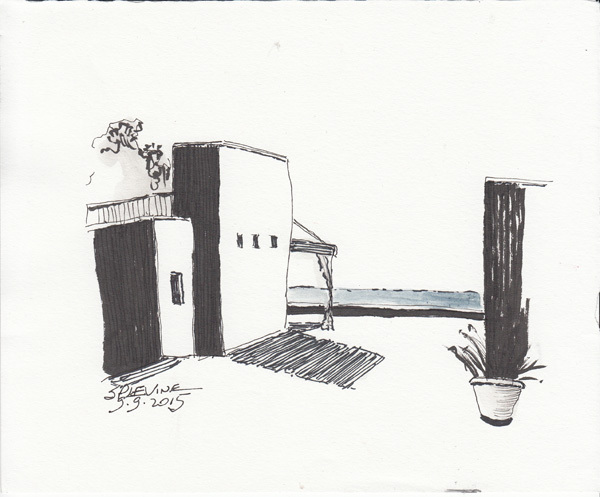 I arrived at the Park 10 minutes before the Art Cart and did a "Fast Drawing" of the front Façade of Pier A. My pen had water soluble ink so I just pulled out some ink with a water brush and may still "add the darks" at home. 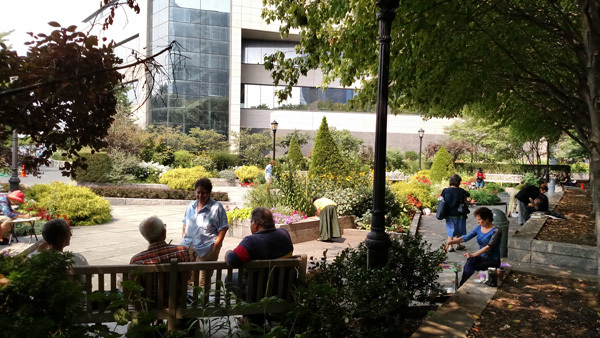 This is one of the Gardens in the Park where many of the sketchers spend the morning. There is abundant shade and a wonderful breeze from NY Harbor, and the Hudson and East Rivers. 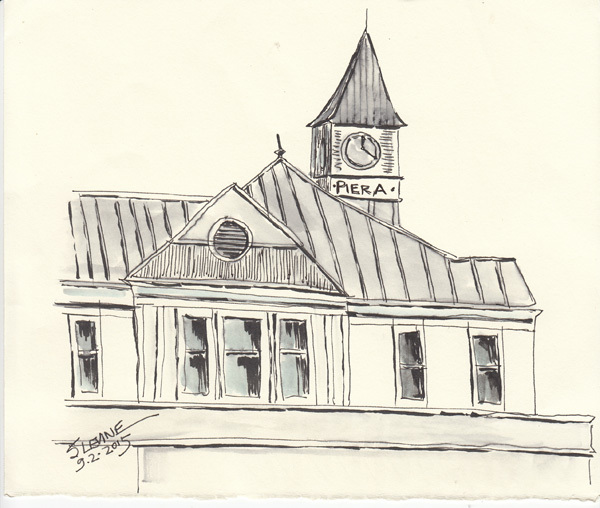 I went to the other end of the Park and sketched Pier A, a recently renovated building between Wagner Park and Battery Park. I was under a huge shade tree and loved being there watching all of the activity in the Park and the Harbor as I painted. This is the end of the Pier A Western façade as it juts out into the Harbor as painted in my accordion sketchbook reserved for NYC paintings. 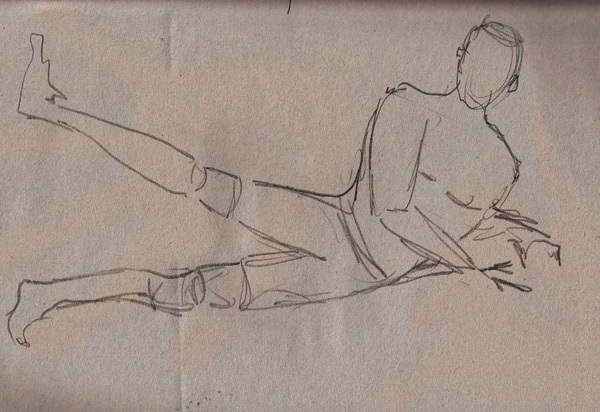 After lunch there were 2 male models at Figure Al Fresco and more than 50 artists arranged in a big circle drawing them in 1, 2, 5, 10, and 20 minute poses. 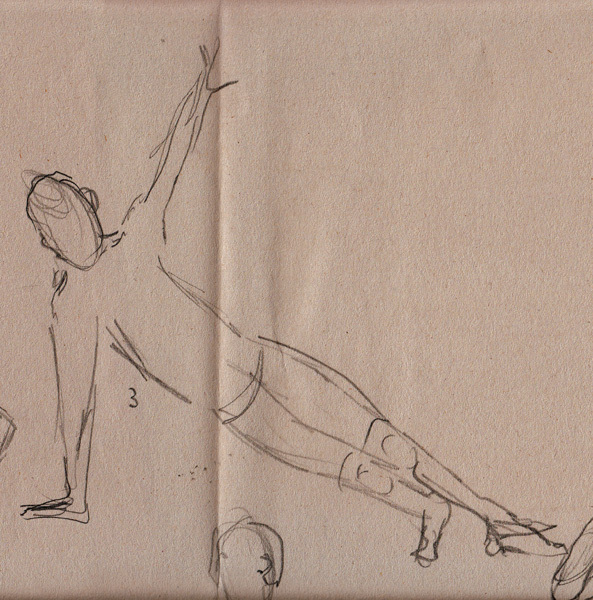 Here are 3 of my 4 five minute sketches. This was the final pose - 20 minutes with the two of them back to back. Pat, Benedicte and I spent a full day last week at the Museum of Art and Design (MAD) and the American Museum of Folk Art. 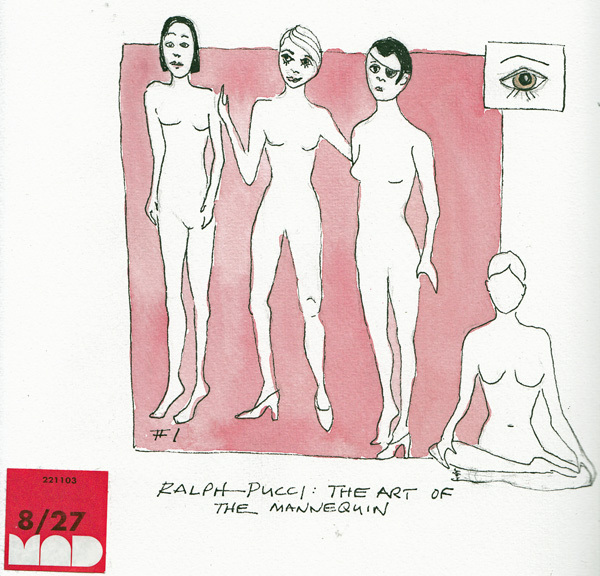 There were two excellent exhibits at MAD, but as artists who like to draw figures, the Ralph Pucci Mannequin exhibit made us pull out our sketchpads and iPad, and want to draw. 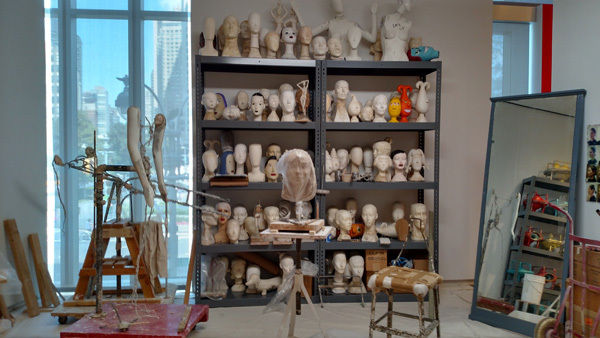 One half of the exhibit showed his studio, with mannequin body part casts and partially assembled and assembled bodies. I love the yellow full body casts on the top shelves. The other half was a huge demonstration of mannequins created by designers - for example Diane Von Furstenberg. 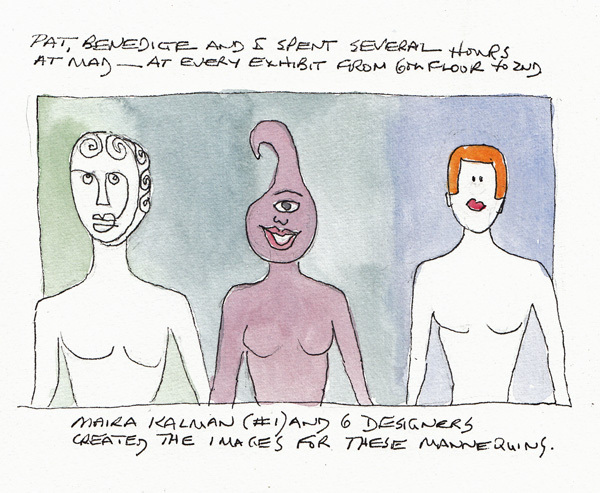 But one of them was even designed by one of my favorite artists - Maira Kalman. Here are two photos I took of the studio section and one of Benedicte photographing one half of the line-up. I selected a few mannequins to draw. The one on the left was designed by Maira Kalman. Next I sketched just the heads of the most bizarre mannequins. Most of their bodies were the same shapes, but in different positions. 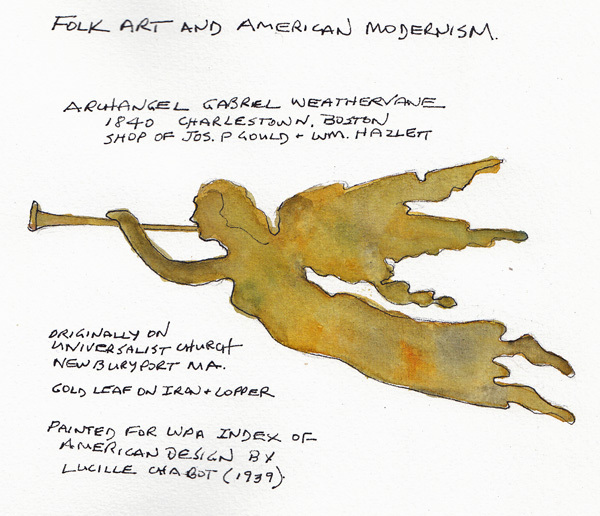 After lunch we went to the American Folk Art Museum to see the "Folk Art and American Modernism" Exhibit and my favorite piece was a 19th C. Archangel Gabriel weathervane. I loved the patina and tried to create some of it with my paint colors.